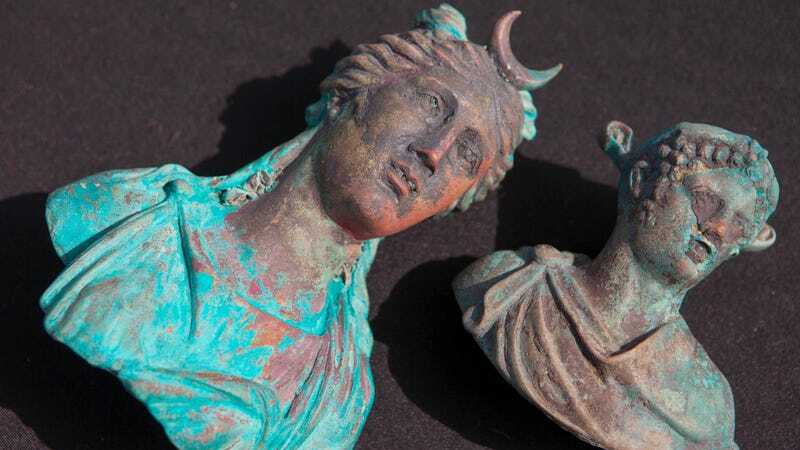 A pair of divers off the coast of Israel have discovered the amazing lost cargo of a sunken Roman ship from circa the fourth century A.D., just lying on the Mediterranean floor. When was the last time you stumbled upon something better than a quarter? The Associated Press reports that Ran Feinstein and Ofer Raanan were diving near the ancient port of Caesarea when they spotted the wreck. (It was the second statue that tipped them off to the fact they’d found something big.) “It was amazing. I dive here every other weekend and I never found anything like that ever,” said Raanan. Among other finds, the cargo of the ship, which apparently sank in the latter years of the Roman Empire (27 B.C.E. – 476 C.E. ), included a bronze lamp depicting the image of the Roman sun god Sol; a figurine of the moon goddess Luna; a lamp resembling the head of an African slave; parts of three life-size bronze statues; a bronze faucet in the form of a wild boar with a swan on its head; and other objects in the shape of animals. Also unearthed were shards of large containers used for carrying drinking water for the ship’s crew. Yesterday’s maritime disaster is today’s astounding archeological find.